The Occupy Wall Street (OWS) movement has proven to be the political spark that ignited the pent-up anger and frustration of millions in the United States. It has awakened broad segments of the great majority who have suffered deeply from a decades-long tidal wave of defeats inflicted by a degenerating world capitalist order that today has no room for concessions, even of the token variety. The long-awaited American fightback, which will take a myriad of forms in the years ahead, is off to an inspiring start. Coupled with multiplying rallies, marches, and occupations of every kind, the Occupy movement has unleashed a national discussion and debate among working people to determine how best to challenge the morally and economically bankrupt system and win. The capitalist system’s elite and their government servants, the now increasingly despised “one percent,” daily impose their solutions to the world economic crisis that they themselves created—more austerity, more cuts in social benefits, more layoffs, more wars, more assaults on the environment, more foreclosures, more racist attacks on the Black, Latino, and immigrant communities and youth. Their “solution” to the challenge posed by the Occupy movement is to try to make it disappear—to physically remove, in coordinated military-style police actions, the tents and encampment supplies, food, medical facilities, books that have been set up in cities across the country. From New York, Oakland, Salt Lake City, Portland, Denver, St. Louis, Albany, Durham, and scores of other cities, to campus and neighborhood occupations, the spectacle of peaceful protesters—from youth to 84-year-old grandmothers—being brutally clubbed, pepper sprayed, tear gassed, and arrested en masse has not been lost on the public. Daily conversations in workplaces and wherever people congregate register heightened interest in the occupiers and general solidarity with their goals. Wall Street bosses have threatened immediate dismissal for clerical workers who might peek out of the windows to view the protests or take a cell-phone snapshot of them. Oakland, Calif., Mayor Jean Quan and other public officials have publicly recounted their participation in national phone calls initiated by the U.S. Conference of Mayors to discuss how to disappear the occupiers. An Obama spokesperson aboard Air Force One told media representatives, according to The New York Times, that the president believed that the right to protest itself had to be balanced by government concerns regarding “sanitation and public safety”! For Bloomberg and his bipartisan partners, who look to the bipartisan congressional “Super Committee” or Joint Select Committee [of 12 members of the House and Senate] on Deficit Reduction, there are no solutions other than massive austerity for working people and more trillion-dollar tax cuts for the rich. Theirs is the same logic applied the world over by a crisis-ridden capitalist order that has imposed draconian measures on the working masses in every sphere of social life to pay the debts of their failing banks, corporations and governments. • On Nov. 2, in Oakland, Calif., in response to the brutal 4 a.m. police attack on the Civic Center Occupy Oakland site, a mobilization or “general strike” of 20,000 trade unionists, youth, and other supporters filled the city streets, forced the closure of banks and other financial institutions, and shut down the Port of Oakland with the support of the International Longshore and Warehouse Union and some cheering and honking truck drivers. • On Nov. 17, where two days earlier carefully planned and orchestrated police violence and mass arrests closed down the Zuccotti Square Occupation, 10,000 CUNY and NYU students, and other OWS supporters rallied at Union Square and marched down Broadway to Foley Square for a rally that grew to over 30,000. The same numbers crossed the Brooklyn Bridge to call attention to the need to create jobs by repairing the nation’s crumbling infrastructure. • On Nov. 15, some 5000 students, faculty, and unionized campus workers were joined by a long march from Occupy Oakland for a General Assembly at Sproul Plaza at the University of California at Berkeley. Earlier in the day campus police used force and violence and scores of arrests to prevent students from setting up a handful of tents. Two California State Universities were shut down tight as almost all of the 600 scheduled classes were cancelled. • Thousands in Portland, Ore., demonstrated a courage and discipline that forced the retreat of cops intent on breaking up their encampment. And a thousand more at the University of California at Davis, following the blatant pepper spraying of a few rows of peacefully demonstrating students sitting across a campus roadway, systematically humiliated and “escorted” a cordon of retreating club-wielding police off the campus. Associated protests and occupations across the country in 1000 towns and cities gave testimony that this movement is here to stay. Placards and banners everywhere display the incredibly unifying and affirming credo, “We are the 99 percent.” The movement rings out with declarations of confidence and clarity of purpose: We are the vast majority. We are the victims of the rule of capital, they all but state! Whatever differences there might be among us are nil as compared to ours with the one percent, with the corporate owners of everything, with the politicians and parties who represent them—with the ruling class! However much one might quibble with the 99 percent figure, it stands in sharp contrast to the pathetic labor bureaucracy’s often stated, “We are the middle class,” or their complaints that “We are being driven from the middle class.” The bureaucracy’s allusion to the “middle class,” now being shattered by the reality of life in capitalist America, implies that labor is no longer the broad working class, the poor, the unemployed, the oppressed nationalities—that is, the vast majority—but rather a more privileged layer defined by relatively higher wages. Occupy is a movement that roars with contempt of the constituted authorities. It is not daunted by court orders demanding that its tent encampments be taken down or by the constant and often brutal application of police violence and repression. Given today’s widespread use of cell-phone cameras and video recording devices, this is increasingly displayed worldwide in the form of peaceful Occupy crowds blinded and gasping from gas attacks, or stunned by deafening sound weapons and other modern day crowd-control devices aimed at dispersing and sometimes maiming or even killing the innocents who participate to express their just grievances. One day, in the name of “law and order,” in the name of “sanitation concerns” or other “legal” pretexts offered up by compliant judges, the encampments are declared illegal and destroyed. The next, they are often re-taken by the peaceful, planned, and massive exertion of a counterforce wherein protesters armed with a political cause supported by millions compel club-yielding SWAT teams to retreat or pay what remains an unacceptable political price—the likening of America, “the land of the free,” to the repressive regimes that the U.S. promotes and protects the world over. Better to retreat, the cops are on occasion instructed, than to fully apply the repressive force on hand and risk the next wave of solidarity coming back in 10-fold or 20-fold numbers. We should note here that New York City has been among the most repressive in the United States regarding the simple right to march down the street. Tedious and highly restrictive permit processes coupled with police barricades forcing demonstrators to walk miles to participate, the banning of sound systems, the denial of city parks to assemble, were the rule in this city—that is, until Occupy Wall Street. Today in New York no activists ask permission to exercise their constitutional rights. Whatever restrictive efforts have been attempted by the police have not been able to stop or deter protests by virtue of the massive and determined nature of the anti-government mobilizations. The ruling class understands that OWS has won support from millions who increasingly understand that this new movement is theirs. The occupations have opened an unprecedented and long-awaited national debate while condemning the ongoing failures of the system itself. Students demand free education and the cancellation of their debts. Thousands march over bridges to mark the nation’s deteriorating infrastructure and the need for jobs to repair or replace them. Hundreds in city after city re-occupy foreclosed housing in solidarity with the evicted poor. And the occupiers even strive, with deep compassion, to provide food and shelter for the homeless and destitute, while noting with contempt that the world’s richest nation can’t do what they are doing. Students and faculty demand affirmative action for increasingly segregated universities, the resignation of university officials and student/worker control of the universities. Teachers demand a reversal of the massive layoffs that have taken the jobs of hundreds of thousands, reinstatement of cancelled classes, and quality education for all. Public employees of every category and from virtually every trade union demand the reversal of the layoffs, salary cuts, enforced non-paid “furloughs,” and the deterioration of public services. Millions demand that the rich be taxed to pay for all the above, that the bank bailouts be reversed, that the corporations be placed under public control or under workers’ control. These demands and literally hundreds of others are the subject of General Assembly debates and in workplaces in every city. All this is taking place while the ruling capitalist parties stand mute, offering no solutions other than further incursions on the quality of life of everyone but the rich. The OWS assemblies overwhelmingly reject the notion—which is cautiously, but steadily, promoted by trade-union misleaders, Democratic Party front groups like MoveOn.org, and NGOs dependent on corporate funding—that the “lesser evil” Democrats are the only alternative. However, in the absence of a mass independent working-class political alternative, based on a rejuvenated and fighting trade-union movement, there is no doubt that lesser-evilism still finds receptive ears. The U.S. political system is in fact meticulously designed to achieve public support in the electoral arena by constantly counterposing one evil to another—today by purposefully enlisting as candidates a gang of right-wing Republican fanatics in order to facilitate the Democrats and Obama moving as far to the right as the ruling class demands. In truth, however, it matters not which of the twin parties are in power. Obama has far exceeded his predecessors in the scope and magnitude of cuts in social programs and reactionary policies, not to mention wars and attacks on civil liberties at home. The name of the game is to provide legitimacy to whichever party wins the rigged game, in which the pre-selected multi-billion-dollar-funded candidates of the rich “battle” for the title. As in any serious high-profit gambling casino, the house is always rigged against the people. Mid-November marked an important challenge to the Occupy movement when several encampments in major cities were dismembered by mass police force on orders from compliant judges or city officials. These attacks have given further drive to the tactical discussions and debates among Occupy activists, who were already considering measures to deal with the onset of the cold winter months. One question remains sharply posed to the movement’s ranks and the emerging, but still vaguely defined, leadership: Are the encampments—the physical occupation of public or private space—envisioned as symbolic of the exercise of people’s power, or are they conceived as the actual embodiment of such power, as mini-communes, and as a conquest that must be physically defended lest the movement suffer a major defeat? Many Occupy activists believe that the government’s obliteration of various occupation sites, as in New York and Oakland, represents a serious setback. Others, more realistically, believe that however important the occupied sites might be, the value of this new movement lies qualitatively more in the unprecedented national political dialogue it has provoked, its emerging radical and anti-capitalist program, and the massive mobilizations that it has engendered. The movement’s power, it is now clear, lies in its bold ideas and actions and in the reverberation of these in the general population. Tens of thousands of trade unionists, working people, youth, and a broad layer of the oppressed communities flocked to the occupation sites less to confront the police and more to express their solidarity with the bold challenge to the status quo that had been posed. It must be stated, however, that the physical power, the sheer numbers, of these mass actions in most cases served as an effective deterrent to police interference. It is one thing to remove a small group of occupiers and their tents in the early morning hours but quite another to take on an angry and determined mass of working people—and especially so when they are backed by the formal declarations of support of the nation’s major trade unions, including the national AFL-CIO. The Occupy movement has set an example for the entire labor movement far exceeding its enthusiastic and welcome support for ongoing union struggles, including mobilizing OWS protests at Verizon stores organized by the Communication Workers of America, where workers are fighting against employer efforts to impose a new crippling national contract, or solidarity actions supporting Teamsters at Sotheby’s Auction house who face similar assaults. However important these and similar labor support activities are, they pale in comparison with the example in microcosm that Occupy has set in reminding working people that factory occupations, such as those in Toledo, Ohio, in 1934, and Flint, Mich., in 1937, pioneered a union-organizing drive that at one point in U.S. history had the potential power to challenge the capitalist system itself. Occupations of the giant General Motors and Ford Motor Company factories, and shutting down entire industries until the workers won union recognition and substantial contract-enforced gains, were among labor’s most profound contributions to securing gains that endured for decades. Today, labor’s misleaders usually limit strike actions, if there are strikes at all, to essentially token one-day protests. And even these are met by the bosses with punishing lockouts, as when Kaiser Hospital responded to a one-day strike of 12,000 California nurses with a four-day lockout. The growth in political consciousness stemming from the Occupy Wall Street example has sparked a long-awaited discussion among working people and their still potentially powerful unions. If young people and loosely associated workers can occupy a city park, why can’t we occupy and close down the nation’s factories, transportation systems—planes, railroads, trucking lines, power plants and all the rest? We have the power. Why don’t we use it? For now, the Occupy movement is the proud and courageous tail that is wagging the giant slumbering dog of American labor and other social movements that have subordinated class mobilizations to alliances or “partnerships” with the class enemy. But it is only a matter of time until the example set by a relative few becomes the norm for the broad working masses. Occupations of city parks will give way to a far more massive movement. We will see giant, united strike waves and new forms of political action and solidarity that can fundamentally change the present relationship of forces and launch a struggle that can change the world. 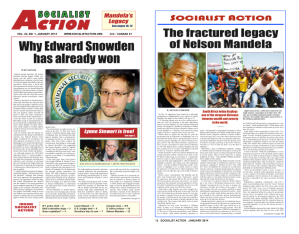 > The article above was written by Jeff Mackler, and first appeared in the December 2011 print edition of Socialist Action newspaper.